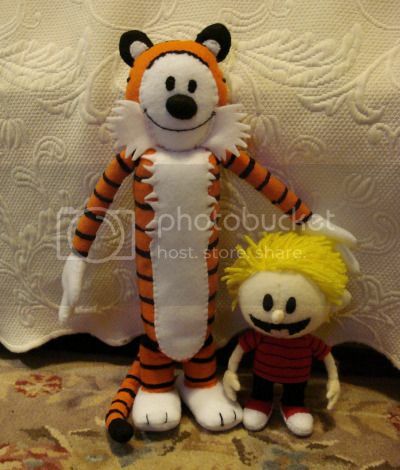 Behold the plush Calvin and Hobbes dolls custom made by artist Lindsay Mays. Calvin is 7 inches tall and has yellow yarn hair. Hobbes is 14 inches tall. They are both handmade from felt. See? I don’t always feel compelled to assail your senses with disturbing Star Trek videos and horribly misguided cosplay. Sometimes–just sometimes–I like to facilitate the sensations of warmness and fuzziness. Via Super Punch, who’s met your imaginary friends, and thinks you can do better.